This crazy snoozefest of a film left more questions, like why was it ever made, than answers! It was a major waste of time. As it droned on and on, with no real information on time or locations portrayed in the film, or what was going on at all!, I realized who the writer/director was, and understood. It’s Paul Thomas Anderson, who hasn’t made one movie I’m a fan of. What’s wrong with this dude??? How is he so humorless when his life partner, the winning Maya Rudolf, is a major comedienne??? I want my two and half hours, that felt like ten times that, back! It’s such an unimportant film. Yeah, it’s “really” supposed to be about how Scientology started, but who cares even then? And it’s far from the origins of that group that I’ve heard over the years, which is that the insane L. Ron Hubbard started it on a dare, to show that he could get people to follow a crazy fake religion. But who really knows? Or cares? Not I, that’s for sure. The Master is basically about a bunch of whack jobs. Why should we waste our time? It’s a family of mental patients, in my opinion, with very murky scenes, at that. In the middle of it, I turned to Mr. X and whispered, “I don’t know what’s going on, but it’s making me not want to eat.” So, it’s good for that one thing, I suppose. 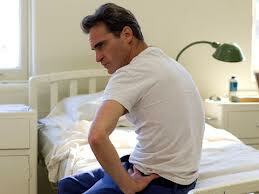 But, despite all this muddle, Joaquin Phoenix is great! In every way; from the character’s insane eyes to his perfectly insecure posture. I’ve never been a fan of his, but this performance was a revelation. Which begs the question: how did actors not nominate this guy for a SAG Award??? I don’t get it! There was supposed to be a backlash from the Oscar voters over Joaquin’s negative comments about them, but not the SAGS. And the Academy still nominated him for an Academy Award, because their purpose is to recognize excellence in the fields, not be petty revenge-seekers. I don’t see how one actor could see this film and not vote for Joaquin! But they nominated full-of-herself Anne Hathaway for one. Who are these committee members? I want the names of every last jealous one of them! If I had been on the randomly-chosen nominating committee this year, as I have been in the past, I would have voted very differently from the main body. Everyone in this film is working so hard, but I have no idea what they’re trying to portray. Except for maybe Joaquin, who, though really excellent, is nuts to begin with! I think Amy Adams is usually great, but how did she get nominated for this??? It made me re-think my fan-ship of her previous performances, and I realized that she always does that bug-eyed slow, quiet talking, and her cred as an actress actually got lowered in my eyes from this film. There’s only one small positive that I could see. Mr. X said these were the most convincing fight, and violent, scenes he’s ever seen. I think that may be because Joaquin is such a crazy person; he certainly gave the fights his all. And that’s definitely not worth wasting your time on. Or mine, on writing anymore about it!